Gallery view: Shows you large thumbnails of your photos and videos, organized in a grid. 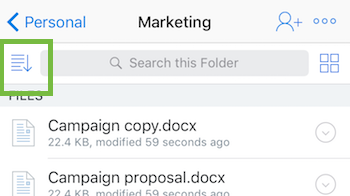 List view: Shows all your files, folders, photos, and videos in a list. You can choose how to sort your files in the mobile app. Tap the middle icon at the top right. The icon is a grid if you're in list view, and a list if you're in gallery view. Tap the sort icon at the top right. Choose an option in the Sort by... menu. You can choose to sort files by date or name. Note: It isn't possible to reverse the order in which the files are sorted. Tap the icon to the right of the search bar. The icon is a list if you're in list view, and a grid if you're in gallery view. Tap the sort icon to the left of the search bar. Choose an option in the Sort by... menu. You can choose to sort files by date, name, size, or type.